Recently a Church leader (an Area Seventy) came to the Shanghai International District to provide some training and talked about the important decision recently made by Church leaders to give renewed emphasis to the Sabbath day. See "Church Leaders Call for Better Observance of Sabbath Day" at MormonNewsroom.com. There is great wisdom in this. I feel that when members understand and love the Sabbath day, they will have habits and attitudes that will help them keep growing in the Gospel and continue nurturing their relationship with the Lord even when it might be easy to drift away. His speech on that occasion [the festival of tabernacles] includes a carefully constructed list of seven specific petitions (1 Kings 8:31–53) [for details, see Jon Levenson, "The Paranomasia of Solomon's Seventh Petition," Hebrew Annual Review 6 (1982) 131-35, as cited by Levenson]. In short, both the appurtenances of the Temple and the account of its construction reflect the character of the acts of creation narrated in Gen 1:1–2:4a. The book of Chronicles goes so far as even to say that Solomon, and not David, would build the Temple because the former is a “man of rest” (menûhâ) and of peace (šalôm) , as his name (šelomoh) would imply (I Chr 22:9). The temple is a house and a sacred mountain, a sacred space, for entering into the presence of God as Moses did on Sinai and for making sacred covenants to advance us in that cause. The Sabbath is a sacred time for drawing closer to the Lord and for remembering and renewing covenants. Of particular importance on the Sabbath is partaking of the sacrament, where we witness that we are willing to take the name of the Lord upon us. There is great significance in this act, and part of the significance points to the blessings of the temple, where we most fully take on the name of the Lord. This point was beautifully explained by Elder Dallin H. Oaks in his April 1985 Conference talk, "Taking Upon Us the Name of Jesus Christ." One of many great resources to discuss and contemplate as we strengthen our approach to the Sabbath day. I would welcome your thoughts on the meaning of the connections between the Sabbath and temple, along with suggestions on how we can better help members appreciate the beauty of the Sabbath day. 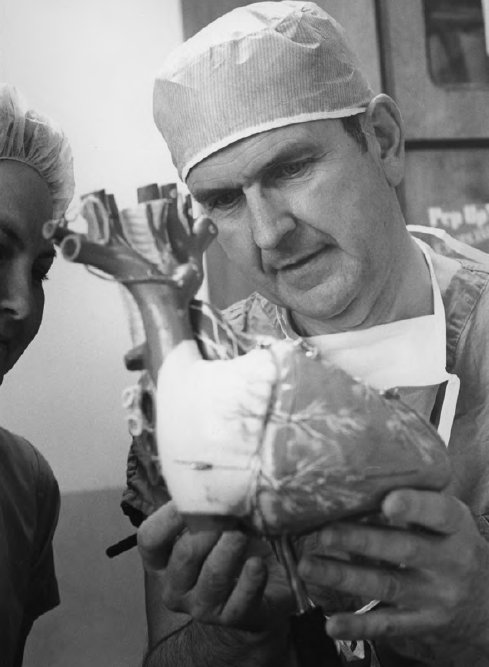 Russell M. Nelson examining a model of the human heart. Last night I read an entire article from BYU Studies out loud to my wife so we could discuss and contemplate the remarkable content. The article is "Discovering a Surgical First: Russell M. Nelson and Tricuspid Valve Annuloplasty" by Austin A. Robinson and Curtis T. Hunter, BYU Studies, 54:1. A brief overview can be read on the BYU Studies website, and you can download the full PDF for $0.99 (better yet, just go ahead and subscribe to this excellent journal!). As Austin Robinson mentions in his overview, the details of this remarkable event have not been widely appreciated. Most of what we knew came from Elder Nelson's description of the event in his April 2003 General Conference addresses, where spoke of an incident "during the early pioneering days of surgery of the heart" when a stake patriarch from southern Utah suffered much because of a failing heart. He pleaded for help, thinking that his condition resulted from a damaged but repairable valve in his heart. Subsequent visits ended with the same advice. Finally, in desperation, he spoke to me with considerable emotion: "Dr. Nelson, I have prayed for help and have been directed to you. The Lord will not reveal to me how to repair that second valve, but He can reveal it to you. Your mind is so prepared. If you will operate upon me, the Lord will make it known to you what to do. Please perform the operation that I need, and pray for the help that you need." His great faith had a profound effect upon me. How could I turn him away again? Following a fervent prayer together, I agreed to try. In preparing for that fateful day, I prayed over and over again, but still did not know what to do for his leaking tricuspid valve. Even as the operation commenced, my assistant asked, "What are you going to do for that?" We began the operation. After relieving the obstruction of the first valve, we exposed the second valve. We found it to be intact but so badly dilated that it could no longer function as it should. While examining this valve, a message was distinctly impressed upon my mind: Reduce the circumference of the ring. I announced that message to my assistant. "The valve tissue will be sufficient if we can effectively reduce the ring toward its normal size." But how? We could not apply a belt as one would use to tighten the waist of oversized trousers. We could not squeeze with a strap as one would cinch a saddle on a horse. Then a picture came vividly to my mind, showing how stitches could be placed—to make a pleat here and a tuck there—to accomplish the desired objective. I still remember that mental image—complete with dotted lines where sutures should be placed. The repair was completed as diagrammed in my mind. We tested the valve and found the leak to be reduced remarkably. My assistant said, "It's a miracle." I responded, "It's an answer to prayer." As with many faith-promoting stories, things are often more complicated than they seem. There are many details related to the specific procedure that Elder Nelson invented on the fly, plus details of what was revealed to him, the relationship to other heart procedures that were known, and the technical matters related to the condition he faced. When these are considered, a cool faith promoting story blossoms into an incredible, gritty, granular episode that almost overwhelms me. Please take a look at this account. Doctor Nelson had been part of the team that developed the first successful heart-lung bypass machine at the University of Minnesota, work that was the basis of his Ph.D. dissertation. After Doctor Nelson came back from further training at Harvard's Mass. General Hospital, he brought the technique to Salt Lake City in 1955, making Utah the third state in the nation with open-heart surgery capabilities. This technique allowed surgeons to see the living heart in action and understand the many mysteries of valve function and other details of the heart, one of the most brilliantly designed organs of the human body. Yes, of course it's designed. Intricately, carefully, brilliantly--it's amazing that it's even possible. Reading the details discussed in this article should further increase your appreciation for the majesty of this vital part of the Lord's Creation. In spite of the potential offered with new techniques, the tricuspid vale had received very little attention among surgeons by the late 1950s. Most of the problems people had were with the other side of the heart in the mitral valve, where rheumatic fever was a common factor causing valve failure. When Doctor Nelson decided to operate on what medical science then declared was an inoperable condition, he did not have the benefit of the experience of other surgeons in operating on the tricuspid valve. As he started the surgery on May 24, 1960, he found the mitral valve had the "stenosis" he expected and he was able to treat it with known techniques. Then he turned to the right side of the heart and its tricuspid valve, where he found the kind of inoperable damage he expected to find. He could thrust all five fingers of his right hand through the greatly dilated valve into the right ventricle. As he pondered the severe damage, he had a critical impression: reduce the circumference of the ring. But how? People who had tried constricting ligatures on the mitral or aortic valves had resulted in spectacular failures and death. Purse-string sutures into the external heart tissue would eventually tear through the heart. Belt and strap approaches had also failed. It would be impossible to simple apply mitral valve techniques to this very different system. There was nothing to guide him--except God. At this point an image was placed in Nelson's mind that gave detailed instructions about how to apply sutures to the flaps of the valve to pull them together and reduce the annulus diameter, restoring valve function. Brilliant. What most impressed me was how technical the revelation was. As he looked at the second valve, with no idea what he could do, he was given a specific piece of information about the need to reduce the diameter of the annulus. He expressed that goal to his assistants, but neither he nor they knew how to achieve it. And then an image was placed in his mind that showed specific details, even with dotted lines indicating where sutures should go. On the fly, without years of animal testing and analysis, he invented and implemented a surprisingly clever procedure that would provide to be brilliantly correct and successful. It didn't take a series of patient deaths after the animal tests, as in other heart innovations, before it began to work. It was successful on the first try. Truly a miracle. The article is heavy in technical detail and was a bit overwhelming at times, but well worth the exploration and learning. Enjoy! This may also be helpful in understanding just what can happen when there is "tight control" in revelation. Certainly shows the extremes that the Lord can achieve in giving revelation. It's not all just warm fuzzies. Update, Sept. 5, 2015: A helpful commenter observed that Dr. Nelson was recognized as one of the top 20 most innovative surgeons alive today. OK, not sure where that list really came from, but it does remind us that Dr. Nelson has earned a great deal of recognition in his profession. I may have erred recently when I spoke of the awkward phrase "in them days" as perhaps the most embarrassing language problem in the original text of the Book of Mormon. That phrase only occurs twice and is easy to miss, especially since it's long been edited out of the text. It was interesting, though, that it's not only acceptable Early Modern English, but also occurs in both cases in the midst of what appears to be Hebraic poetry, almost as if it were an ironic marker saying saying, "Look here! This is not as clumsy as you think." A much better candidate for the most embarrassing language issue in the text is the ubiquitous and often annoying phrase, "and it came to pass." It has offended many, especially those eager to find fault with the Book of Mormon. Though it is biblical, of course, it is vastly overused compared to the Bible, occurring at over twice the rate found in the Bible. Clumsy, dull, awkward, annoying, and downright embarrassing. And it was even worse in the earliest text of the Book of Mormon, since many of its most awkward and annoying occurrences have been edited out to make the text sound like better modern English, though it's still highly loaded with the phrase. So there's my candidate for the most embarrassing aspect of the original Book of Mormon text. Interesting, no? But it gets even more intriguing. Pushover that I am, I would personally be satisfied with a Mayan inscription reading And it came to pass.... Or a 1600-year-old skeleton at the base of Hill Cumorah with a steel sword lodged in its ribs. Or the bones of a 1900-year-old horse unearthed amid the wheels and yoke of a chariot. Nice list. Several are unreasonable and just aren't going to happen, but . . . be careful what you ask for, folks. As one of my other readers quickly pointed out with a link, there is in fact a Mayan glyph meaning essentially "and it came to pass," and a non-LDS scholar is the one who said "it came to pass" is a reasonable translation for it. The Mayan usage and the whole story around "and it came to pass" is actually much more interesting, as told by Brant Gardner in "Does 'And it came to pass' Come to Pass Too Often?," Meridian Magazine, July 7, 2004. Read this, please. There you will see that "and it came to pass" was actually used frequently by the typesetter as a marker for breaks in the unpunctuated Book of Mormon text, akin to how it was used in Hebrew. You will also learn more about the surprisingly interesting Mayan connection. Since our critic was not, of course, serious in his statement, I can fully understand why none of this will actually be particularly "interesting" to him and don't expect any softening of his stance, but to those open to investigating the authenticity of the Book of Mormon, this glaring, clumsy weakness in the text may actually be a surprising strength. It's worth thinking about. In a recent post examining the language of the Doctrine and Covenants, I found that the Early Modern English style of using "did" for past tense, such a common feature of the Book of Mormon, was not common in the Bible and relatively rare in the 1835 Doctrine and Covenants (see "Did You Notice? What the Doctrine and Covenants Tells Us About the Earliest Text of the Book of Mormon"). I mentioned that the next test would be to look at command syntax, which Carmack Stanford has examined with surprising results. Basically, he has shown that the complex grammar involving the verb "command" in the Book of Mormon is rather characteristic of pre-KJV Early Modern English (EModD), differing sharply from the Bible. The Book of Mormon favors complex "layered" structures like, "He commanded the blogger that he should stop writing such boring posts" instead of the more modern pattern, "He commanded the blogger to stop writing such boring posts." When "command" governs a subsequent verb, the Book of Mormon strongly favors the former finite pattern, lacking the infinitive "to," while the Bible and modern English strongly favor the latter infinitive form. The finite form is used 79% of the time in the Book of Mormon, but only 18% in the King James Bible. Update, Aug. 9, 2016: Analysis of the use of command syntax in the 1835 Doctrine and Covenants as well as in our current edition shows strong differences in command syntax relative to the Book of Mormon. The results tend to be closer to the King James Bible's usage, though there may be an influence from Book of Mormon language in the Doctrine and Covenants text, especially for the sections written prior to publication of the Book of Mormon. Note from Aug. 10, 2016: I have revised my counting method to more closely follow Dr. Carmack's preferred counting technique. Some of my previous numbers involved overcounting. If the infinitive "to" only occurs once after "command," it's one instance of an infinitive verb, even if additional verbs follows. Likewise, if there is only one "that" in a finite phrase, it counts as one instance even if more than one verb is governed by "command." The overall rates change very little because my overcounting affected both finite and infinitive forms roughly equally. The same applies for layered versus simple. One important error, though, was taking Carmack's rate of 73% layered in the Book of Mormon to apply to all uses of command. It actually applies to the finite verb cases. The overall rate of the finite case in the Book of Mormon is 58%. Sentences with "command" governing a verb are in finite form 79% of the time in the Book of Mormon, and 73% of those finite case are in layered format, for an overall layered rate of 58%. The 1835 text has 40 instances of the verb "command" in some form directly governing one or more other verbs, with a total of 44 50 verbs that are so governed. The governed verbs are in finite form 14 16 times, or 32% of the time, while they are infinitives 68% of the time. The 32% finite form rate is far below the 79% rate in the Book of Mormon (based on the Earliest Text), but somewhat higher than the 18% rate of the King James Bible. Finite forms are often in the layered structure, e.g., "I command him that he shall...." instead of the simple form, "I commanded him to ...." However, "that" plus a finite verb can also occur in a simple, non-layered form, as in "I have commanded that you should pretend to no other gift...."
A count of layered vs. simple format for command syntax in the 1835 Doctrine and Covenants gives 31 35 occurrences of governed verbs in simple format and 13 15 in layered format, for an overall layered rate of 29.5% 30%. Carmack reports a layered rate of 58% 73% in the Book of Mormon, and 7% (37.5% of the 18.8% finite forms) in the King James Bible. Of the 40 occurrences of "command" as a verb governing another verb, in 27 cases the command form was entirely simple, in 11 cases it was entirely layered, and in 2 cases a single instance of "command" was used with both forms. Thus, the verb "command" was used in layered forms 13 times (11 pure occurrences+ 2 mixed occurrences), and counting the mixed cases twice in the denominator, we get a rate of 13/42 = 31% for the rate at which the verb "command" is applied in layered formats. Similarly, the rate at which "command" is followed by finite verbs is 33%. In tracking command syntax, I attempt to follow Carmack Stanford in identifying forms of the verb "command" that govern at least one other verb. 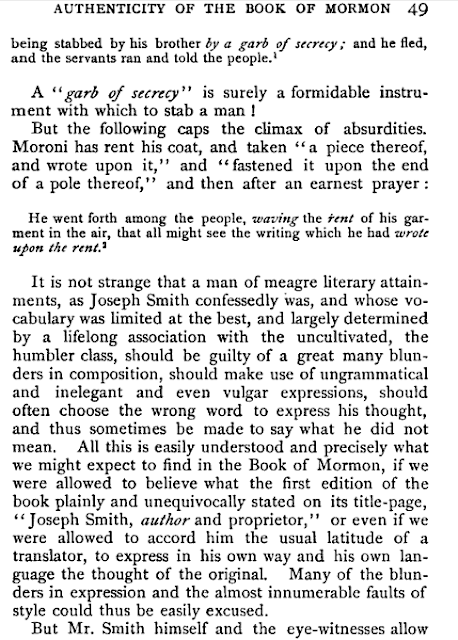 Sometimes an instance of "command" governs two or more verbs, and in two cases the results are mixed, meaning, for example, that "command" governs both a finite verb and an infinitive, as in: "I command you, my servant Joseph, to repent [infinitive] and walk more uprightly before me, and yield to the persuasions of men no more; and that you be firm [finite form] in keeping the commandments...," which has one three infinitive verbs [to occurs once + verb(s)] and one finite verb [be] in a "layered" structure (e.g., "command you that you" + finite verb, which is often the auxiliary/modal verb should/shall + another verb). The 1835 Doctrine and Covenants' first two occurrences of command syntax come from quoting Genesis 3 ("commanded that they should be brought unto Adam" and "The woman whom you gave me, and commanded that she should remain with me"). I exclude these from the statistics since they do not help us understand the language of Joseph Smith and the scriptures he created, but that exclusion has very minor impact on that statistics. Our current printing of the Doctrine and Covenants is different in many ways, lacking the Lectures on Faith, having a variety of textual changes, and also having revelations given after the printing of the 1835 edition. Analysis of its command syntax shows the verb "command" in some form was used to govern one or more verbs 56 times, with a total of 60 70 verbs being so governed. Of those 60 70 verbs, 46 53 occur in a simple form and 14 17 in a layered form, for an overall layered rate of 14/60 17/70 = 23.3% 24.3%. These verbs occur as infinitives 45 52 times and as finite verbs 15 18 times, for a finite verb rate of 15/60 18/70= 25.0% 25.7%. These rates are closer to the low rates in the King James Bible and remote from the high levels of the Book of Mormon. The 56 instances of the verb "command" governing other verbs occur in purely simple forms 42 times, purely layered forms 11, and mixed forms 3 times. They govern only infinitives 41 times, only finite verbs 12 times, and mixed forms 3 times, showing a finite rate of 25.4%. Though it may be a statistical fluke due to small sample size, the command syntax in the modern printing of the Doctrine and Covenants seems to show a high finite rate (over 50%) in the earliest sections recorded before the publication of the Book of Mormon. Sections 5 (the earliest occurrence of relevant command syntax) through 19 (recorded shortly before publication of the Book of Mormon) show 15 occurrences of finite form command syntax and 8 in the infinitive, for a finite rate of 65%, rather close to the Book of Mormon. After that, the finite syntax plummets. If that observation is correct and if it has any significance, then one might speculate that during the days of preparing the Book of Mormon and its manuscripts, it may have been that at least this aspect of Book of Mormon language was fresh and strong in Joseph's mind, and subtly influenced other writings or dictation at this time. Following publication of the Book of Mormon, perhaps his own language became more controlling. The question, of course, is whether Book of Mormon language was influencing Joseph, or whether it was entirely the other way around. If he was a prophet and was obtaining revelation to dictate the text of the Book of Mormon with a tightly controlled process, I can see the logic of a the language of the translation affecting him strongly during this period. On the other hand, one can assume it was just his natural language all along, affected by his desired to sound archaic and scriptural, and that those constraints gave us the language of the Book of Mormon, which then may have changed naturally as he matured. Or perhaps other hypotheses need to be explored. As with the exploration of the subtle use of "did" in the Book of Mormon for past tense, and its general absence in the Doctrine and Covenants, this tentative and possibly error-prone examination of command syntax suggests that an appeal to Joseph's natural language and his desire to imitate the KJV fails to account for the high level of layered, finite command syntax in the Book of Mormon. However, the presence of high levels of finite syntax during the early days of the Doctrine and Covenants that overlapped the Book of Mormon translation and preparation process could suggest that such high levels do not necessarily require miraculous guidance. On the other hand, those trends could also be explained as a side effect of the miraculous guidance that gave Joseph the text to dictate to his scribes in the first place, which may have subtly but strongly influenced how he formulated command syntax when giving other scripture during that time. As always, further work is needed, and this present work may contain a variety of errors requiring revision. Your feedback is welcome. 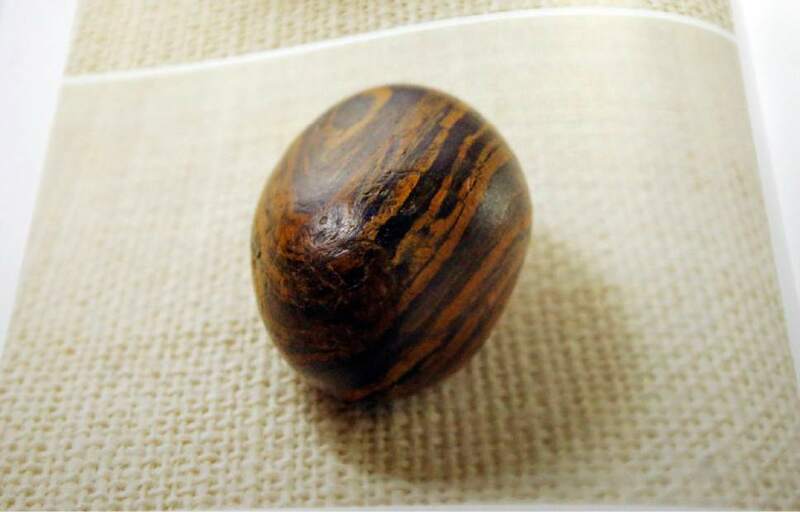 Photo of the long-discussed seer stone used by Joseph Smith. What's interesting news for many Latter-day Saints is, for some of our critics, simply earth-shattering and hopely faith-shattering for benighted Mormons. "Mormon church releases photos of ‘seer stone’ used by founder Joseph Smith" is the headline at the Salt Lake Tribune. From the various accounts of Joseph's translation process for the Book of Mormon that have been published for many years, it has long been clear that Joseph used a seemingly ordinary rock as a "seer stone" for at least a significant portion of the translation process. See, for example, the Church's prior statement in the LDS Topics area of LDS.org entitled "Book of Mormon Translation" and Richard Lloyd Anderson's 1977 Ensign article on the topic (the Tribune says 1974, a minor error), where the mechanics of the seer stone and the hat are mentioned. Elder Russell M. Nelson also discussed this in detail in his 1993 Ensign article, "A Treasured Testament," which I highly enjoyed. As I understand it, Joseph stared at the seer stone in the darkness provided by a hat and somehow was able to dictate words hour after hour to his scribes to provide the original text of the Book of Mormon. Was there something miraculous--something even cooler than iPad technology, for example--about this stone or the two stones in the Urim and Thummim that came with the gold plates? Did he actually see something with his physical eyes, as David Whitmer thought, or did he otherwise see or sense something in his mind? Was the real purpose of the physical stone simply to help him concentrate and receive inspiration? We really don't know. We don't know what was going on in Joseph's mind, but we can be pretty sure what wasn't going on in the hat: he wasn't staring in the dark at a paper manuscript written by Solomon Spaulding or some mysterious team of scholars capable of plausibly describing places and even names in the Arabian Peninsula, and also capable of crafting Hebraic poetry, Hebraic puns, and awkward, even laughable English phrases that are good Semitic phrases. Of course, if there had been a carefully crafted text in the first place, why go through the hassle of spending three months dictating the text word for word? Just hand the text to the printer, or at least hand the text to a scribe to make a copy for the printer. Why add a painful three-month delay that would introduce many typos and result in a dictated text devoid of much-needed punctuation, that surely would have already been present in a real but fraudulent source manuscript? Multiple witnesses of the process also affirm that he did not even have a Bible present, though the dictated text closely follows the KJV (though with hundreds of mostly subtle differences). It's close enough to the KJV, including parts that seem to have flaws, that many LDS people have assumed he must have had the KJV text to use when the Book of Mormon quotes the Bible, but something else may have been going on. The dictated text seems to generally use the KJV when it is close enough to the theological purposes of the Book of Mormon, not giving us the miraculous update to a perfectly translated pristine Ur-text that we would readily convince scholars today. While the nature of the translation process is puzzling, it is clear, however, that the text was actually dictated to scribes just as they and other witnesses maintained. The surviving portions of the original manuscript make it obvious that this was an orally dictated text. That's an important part of the story in the recent release from the Church, which highlights the significance of the original text, the printer's manuscript, and the massive project to provide the papers of Joseph Smith (see JosephSmithPapers.org) and the massive work of Royal Skousen giving us the Earliest Text manuscript for the Book of Mormon. Understanding the origins of the Book of Mormon requires careful, detailed consideration of the Earliest Text, our best estimate of the words actually dictated by Joseph. It is there we find much that was laughable in Joseph's day which has become a little more respectable upon further examination. His first example is still with us in the current printing of the Book of Mormon, while the second example has long-since been corrected to more conventional English. In Helaman 9:6, we read that the Nephite judge had been “stabbed by his brother by a garb of secrecy.” Critics have contended that this makes no sense in English, since “garb” has the same meaning as “garment” or “clothing.” This idiom is the same as the English “under cloak of secrecy.”[iii] But what is most interesting is that the Hebrew word begged means both “garment” or “garb” (e.g., Genesis 39:12-13) and “treachery.”[iv] This is an obvious word-play in the Hebrew original of the Book of Mormon. As for the preposition “by,” in Hebrew its range of meaning includes “in,” (locative), “with” or “by means of” (instrumental). This kind of thing is found on page after page of the Book of Mormon. Names, word usage, and grammar that is objectionable to learned critics turns out to be plausible or even to offer serious evidence for ancient authenticity far beyond the ability of Joseph Smith to fabricate. [In] the 1830 edition of the Book of Mormon, we read that "when Moroni had said these words, he went forth among the people, waving the rent of his garment in the air." (p. 351.) 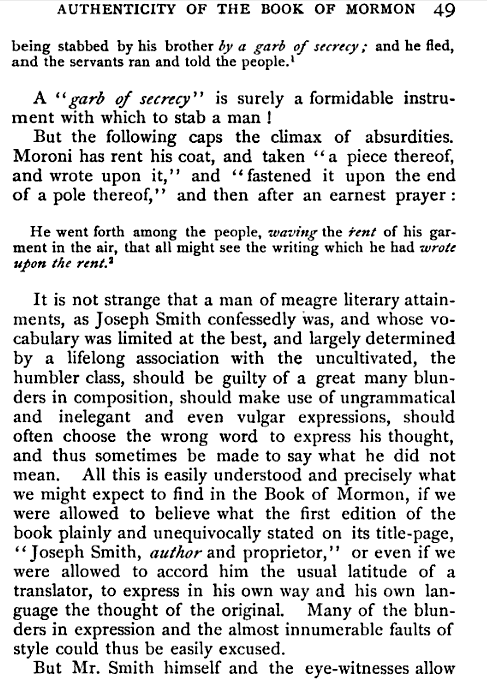 When the word "rent" is used as a noun in English, it may refer to a hole caused by rending, but not, to my knowledge, to a portion of rent cloth; the unlikely usage of "rent" in English as a noun no doubt contributed to the fact that, in subsequent editions of the Book of Mormon, it was changed to read "rent part" (Alma 46:19). But the Hebrews would, in this instance, use but one word, qera', "rent (part)," coming from qara', "he rent, tore," for nouns, in Hebrews, are derived from roots--as are Hebrews verbs--by the addition of certain vowel patterns that distinguish them from other parts of speech. The original text has numerous such "flaws" which reflect its Semitic origins that "leaked" through the translation process, indicative of some level of "tight control" in the generation of the text that Joseph dictated. Understanding them helps us appreciate the nature of the dictated text. As a result, we are justified in thinking that smote is the correctly translated word. That conclusion is based on the thesis that Early Modern English is actually in the Book of Mormon as originally dictated, which I'll mention in a moment. First let me point out that a search of "had wrote" and "hath wrote" shows that this non-standard usage for our days also has deep roots in written English, suggesting that like its "hath smote" cousin, was not non-standard in the past. E.g., Shakespeare's 1608 King Lear has a "hath wrote." Other texts using it date to 1588, for example. But why would we care about Early Modern English and think it has anything to do with the 19th century translation of the Book of Mormon? In my opinion, a whole new level of rich data to explore has been opened up in Royal Skousen's careful work pointing to unusual elements in the dictated text that show numerous features of archaic English that actually cannot be obtained by simply imitating the King James Bible. Beyond the Hebraisms of the text, a controversial and somewhat shocking, even troubling discovery, something that should be much more interesting than the appearance of the seer stone, is the finding that much of the awkward grammar of the Book of Mormon, long thought to just reflect Joseph's poor education, is not so much bad modern English as it is good Early Modern English (EModE), often reflecting an era in the language slightly before the King James Bible. This finding from Royal Skousen, who understands the original text of the Book of Mormon better than any other scholar today, coupled with heavy additional analysis from a linguist, Dr. Stanford Carmack, has been the subject of several posts here at Mormanity with some further analysis and exploration of my own. What it means and how it happened is the subject of ongoing speculation and debate, but it's something that demands attention for anyone interested in understanding how the translation took place and what it actually is. They suggest that their work buttresses the case that the dictated text had some level of tight control. It at least seems that something was going on that simply cannot be explained by Joseph fabricating the text himself or just making stuff up as he dictated hour after hour. That's part of the real story here and it's a story that is just getting started as we explore the data. Not sure where it will lead and if it will withstand more detailed investigation, but I look forward to learning more. In any case, the stone is a blank slate for us, while the dictated text offers a treasure trove of information remaining to be dug out. Often when I'm calling customer service, especially for technical support issues with computer or software trouble, the call is frustrating and often a painful waste of time. I often encounter people who really don't know enough about the technology they are supporting to provide serious help. Sometimes I have to say, "May I please speak with your supervisor?" in order to reach someone who can actually help. Yesterday, though, I asked that question for a completely different reason: I was stunned and delighted with the quality of support my wife and I were receiving, and I wanted to make sure the company knew. My wife was having some serious issues with her iPhone that we felt really needed tech support. We were both tired, but to catch Apple tech support during their business hours, we made a late evening call from China, and quickly reached a man named Chris. No long waiting--very nice. As we described a serious of issues and problems that would baffle many tech support call centers, he patiently walked us through a number of steps and helped us troubleshoot very efficiently. I was impressed with his cheerful, friendly tone. It was like an old friend kindly helping us out. He not only knew his stuff, but he knew how to explain things to ordinary mortals to help them better understand, and did it all in a positive, friendly way that made it fun to chat with him. At one point, as he helped us understand what had gone wrong in a previous software update, he started using a home-spun analogy about what might happen to a patient getting brain surgery if the patient were dragged away from the doctors in the middle of surgery. It was hilarious, and I had to jump in at that point. "Chris, as someone who has been jaded for years over bad tech support calls, I have to say this is the most positive, even delightful tech support experience we've had. I wish I could talk to your boss to let him know!" "Actually, he's right here, if you'd like to." I found that he had a boss with a sense of humor and enough patience to listen to a couple of delighted customers praise his employees. When I mentioned his clever analogies, the boss chuckled because this was a trademark of Chris's style. He's a natural teacher who uses a variety of tools to help his customers. Wow. It was like being in a different dimension. An out of body experience. I came away from a tech support call not feeling upset and frustrated, but actually inspired. I don't mean to promote any particular company, but I do want to promote the positive example that Chris set for us. What would life be like in the Church if we could provide that kind of friendly, positive, attentive "technical support" to our members when they have questions and problems? What if home teachers and visiting teachers gave that kind of energy to their work? What if bishops and other local leaders could consistently imitate Chris's great example? They do a great job in many cases, but sometimes we tend to overlook the sincerity and the deep needs behind tough questions asked by members or investigators. "Pray about it" or "Reinstall your testimony" may not sufficiently helpful responses. We may not have answers, but helping others get in contact with those who do would be much better than ignoring the problem. "Please hold" and an endless round of the Tabernacle Choir is not going to solve the problem. Great customer service can work wonders. Let's pay more attention to how we serve and stay cheerful, positive, and helpful. Of course, that's what we should all know, but this little episode brought that message home to me in a new way. Part of what made the call so fun for us was being able to praise someone to their boss. Perhaps when we see great things from those who serve us, thanking them and letting others know might make things even better and encourage the kindness we experienced. An Embarrassment . . . of Riches in the Book of Mormon Text--And a Surprise from "Them Days"
When I first opened up my newly purchased blue-bound volume from Royal Skousen containing the details of the surviving original text of the Book of Mormon, I was immediately disappointed. Yikes, hick grammar! Not just archaic KJV language, but genuinely bad grammar, like "he found Muloki a preaching the word." I was chagrinned and wondered why we couldn't get more up-to-date English in the divine text. Having the beautifully printed summation of Royal Skousen's work, The Book of Mormon: The Earliest Text (New Haven and London: Yale University Press, 2009), hereafter The Earliest Text, lessens the impact of the awkward grammar, but the discomfort is still there. As I read more about the process, I came to terms with the idea that God could give revelation to people in their own language, even their own dialect. I guess that was OK--except now there's growing evidence that many of these "errors" weren't necessarily the result of Joseph's New England dialect and aren't as much bad English as much as they are legitimate older English, namely, Early Modern English, often slightly predating the era of the King James Bible, in spite of heavy quotations therefrom. Puzzling, strange, weird, and controversial--but with detailed data that shouldn't be ignored. While I saw some grammar that bothered me, I'm glad the first few pages I looked at did not contain what may be the most jarring grammatical oddity in the text: "in them days," with two painful occurrences in the Earliest Text of the Book of Mormon at Helaman 7:8 and 13:37, which Joseph mercifully exterminated in the 1837 edition. It's not just quaint or archaic to my ears, but immediately evokes a visceral reaction in me because it sounds so uneducated. Please, I can handle someone a preaching as they are a going, but not if it happens "in them days." As I wondered about those two occurrences, it seemed strange that they were so close together in the Book of Mormon, both in the Book of Helaman. I wondered if there might be other factors that their usage had in common. Interestingly, I discovered that both occur within quotations of public laments from prophets, quotations rich in parallelism, with apparent elements of Hebrew poetry such as paired bicola. Reference to "days" (including "the morrow") occur in the middle of the slippery chiasmus, and in the middle and outer ends of the large chiasmus. Days is a unifying feature, and the jarring "in them days" at the end almost seems to invite us to look at these often-overlooked words in new ways to understand the structure and poetry that is there. Poetry marked with an ironic instance of hick grammar (albeit acceptable EModE)--strange, I know. Yes, perhaps it's another example of the many ironies found in the Book of Mormon, where weak and foolish things start getting a little stronger and smarter over time. For those of us puzzled over the fascinating and fairly strong occurrence (so it seems, tentatively) of Early Modern English (EModE) in the Book of Mormon, the way it got there is a subject of debate and speculation. One hypothesis is that Joseph's natural dialect (New England?) coupled with his attempt to sound scriptural, imitating archaic forms in the KJV, might have produced the results we see. The challenge is that the KJV doesn't provide the knowledge he would need to do much of what he did in dictating the Book of Mormon text with so many EModE elements. Did his natural speech provide the rest? It's hard to say, but one suggestion has been to compare his original form of the Doctrine and Covenants, the 1835 version, for clues. So here are my initial observations. Using the 1835 Doctrine and Covenants (available online at Josephsmithpapers.org), I have considered how the word did was used in light of Stanford Carmack's article, "The Implications of Past-Tense Syntax in the Book of Mormon," Interpreter: A Journal of Mormon Scripture 14 (2015). My hypothesis before I dug into the text was that Joseph, whether he was a prophet or a fraud, would likely have maintained many subtle aspects of the linguistic fingerprint of the Book of Mormon that he translated/authored, so I would not expect the two texts to be extremely different. For us believers in the authenticity of the Book of Mormon, we may hypothesize that Joseph's dictation of the Book of Mormon text was largely a reflection of his own language and dialect, coupled with KJV language, or we might hypothesize that there was often tight control of the dictated text and that the language he uttered to his scribes was largely given by inspiration. Either way, I would expect the scriptural language of the Doctrine and Covenants to preserve some Book of Mormon elements, probably including some of the subtle ones with EModE flavor, though I would also expect the EModE influence to be somewhat weaker. If it suddenly became much stronger as modern scripture was generated, that would be a surprise. If it was nearly as strong, perhaps that would suggest that it was still his natural language with surprising EMoDE remnants or that the language of revelation was, for Joseph at least, somehow "dialed in" to an EModE-heavy dialect. If a significant part of the EModE in the Book of Mormon was largely foreign to Joseph's language and seemingly the result of a puzzling miraculous transmission of translated text somewhat predating KJV language, as Carmack and Skousen argue, then I would expect that he surely would have learned from his dictation and subsequent study of the text, and would have naturally applied similar conventions and style to some degree, but to a lesser degree, as he penned the Doctrine and Covenants or even as he gave religious lectures. Again, I'd expect the EModE to be toned down somewhat. My surprise is just how different the Book of Mormon is from the Doctrine and Covenants. Though the language of the Doctrine and Covenants has a KJV feel, the subtle things that reveal EModE influence in the Book of Mormon are much different in the Doctrine and Covenants (based on my brief explorations so far). It's as if the EModE signal has been almost wiped out. It's that way when I look at the subtle use of did to express past events. It's that way when I look at characteristic non-KJV phrases with EModE flavor like "if it so be." The Doctrine and Covenants has a touch of those things, but just a touch. A surprisingly light touch that points to something really remarkable taking place in the language of the Book of Mormon, something that appears to be surprisingly independent of Joseph's personal writing style. These are tentative observations that will require further study. Maybe I'm missing a lot. But I think when it comes to the language of the Book of Mormon, we've all been missing a lot for a long time. There's an fascinating story waiting to be revealed. It may not be what we are expecting nor what we are comfortable with. But I'm anxious to see where it will lead in the end. The Book of Mormon invites, even demands scrutiny. It's time we dig in more. By way of background, Carmack examines the Book of Mormon's heavy use of did in ways that are archaic for modern English. What's interesting is that the way did is used in the Book of Mormon was already somewhat archaic when the KJV text was prepared, but statistically fits well with its usage in the mid to late 1500s. Carmack looks at a particular form of did, the affirmative declaratory periphrastic did ("ADP did"), in which an affirmative sentence expresses the past tense by using did plus a verb, as in "Moroni did arrive with his army." ADP usage is not intended to be emphatic ("actually, I must confess that I did eat that donut") nor is it used in questions ("Did you eat it?" is not ADP). ADP did has several variants. Did can be adjacent the verb (that's adjacency) or separated by one or more words (ellipsis). It can occur in inverted order with the subject after did (inversion, e.g., "thus did Alma and Amulek go forth"). It can also have an adverb or an adverbial phrase between did and the infinitive (intervening adverbial use, as in "I Nephi did again with my brethren go forth into the wilderness"). [Eve] took of the fruit thereof, and did eat, and gave also unto her husband with her; and he did eat. For critics not willing to read and consider the analysis of Carmack, that one bite of ADP did is all that's needed to demonstrate how Joseph crafted past tense in the Book of Mormon. He just glommed onto Genesis 3:6 and used that pattern over and over. In fact, he way overdid did, just like he overdid "and it came to pass." But just as subsequent analysis of the Book of Mormon annoying abundance of "and it came to pass" actually points to long-missed strengths in the text and authentic aspects of this usage that go beyond merely imitating the sparser use in the KJV (see Brant Gardner, "Does 'And it came to pass' Come to Pass Too Often? ", Meridian Magazine, July 2004; see also a relevant article FairMormon.org), so also Joseph's seemingly clunky and annoying overuse of did points to something more sophisticated than mindless overuse of an infrequent KJV artifact. What's interesting is how widely the KJV text differs from the Book of Mormon in how did is used. Of the 6,797 past tense counts Carmack has found in the Book of Mormon, there are 4,951 occurrences of simple past tense and 1,846 occurrences of ADP did, giving a gargantuan ADP did rate of 27.2%. In the Bible, with only 515 occurrences of ADP did and nearly 30,000 cases of simple past tense, the ADP did is a meager 1.7%. The differences go beyond just the magnitude of ADP did occurrences, but also in how they are broken down among variants, as shown in Table 1 from Carmack's article. When it comes to did and especially ADP did, the KJV text has quite a different flavor than the Book of Mormon. Alvar Ellegård, a non-LDS scholar who dug into ADP did and its history in English, has shown that ADP did usage had a sharp peak in the mid-to-late 1500s, reaching an average rate of nearly 10%, while it was only around 2% in the 1520s when Tyndale's Bible came out that heavily influenced the KJV text. When the KJV Bible was published, ADP did was plummeting sharply again, being around 3%, and would continue to taper off. Today we rarely use it. From documents such as the Salem Witch Trials, we can see that ADP did persisted at relatively high level in New England speech into the 17th century, but not as high as during the peak era of EModE. After the 18th century, ADP did does not appear at high rates in a sustained way as it does in the Book of Mormon, based on Carmack's searching so far: "Sustained high-rate use of ADP did has been found so far only in 16c and 17c texts. A good measure of this use seems to be past-tense expression consisting of at least 20% adjacency usage. The BofM has these high levels of use." The ties to EModE extend beyond the high overall rates alone. Statistics for adjacency, inversion, and intervening adverbial use also show rates consistent with EModE texts and removed from modern English and from other texts of Joseph's day, including texts seeking to imitate KJV language. The Bible use of ADP did is lopsided in the verbs it is applied to. Over 115 of its 500 counts (over 20%) involve "did(st) eat", as in Genesis 3. In the Book of Mormon, the most common verb used in ADP did is go, with only 54 counts, less than 3%, pointing to a more relatively more uniform distribution. Analysis of ADP did with individual verbs also shows fairly good correspondences with EModE texts. For example, the Book of Mormon avoids "did die," always using the simple past tense instead--a feature consistent with other early EModE texts. Analysis of other verbs gives mixed results, but generally consistent with EModE usage. During the brief era of high ADP did usage in English, some religious texts had rates as high as 51%, even higher than what we have in the Book of Mormon. But did New England dialect maintain high ADP did rates? Carmack notes that evidence from the Salem Witch Trials points to rates as high as 3% among some New Englanders in the 1690s, when the rate in England was generally even lower. But this elevated rate in New England dialect doesn't come close to accounting for the high rates in the Book of Mormon. ADP did rates were on the decline after the 1690s, and the low rate (1.7%) in the KJV Bible would be expected to exert a leveling effect on any dialects with high rates. As further evidence of how New Englanders used ADP did in Joseph's day, Ethan Smith's scant use of it in View of the Hebrews provides further evidence that the Book of Mormon's verbiage is not a product of Joseph's environment, an issue Carmack explores at length in his article. Others who wrote text with imitations of KJV language do not replicate these high rates of ADP did. High ADP did is a surprising and unexpected feature of the Book of Mormon's dictated text. So ADP did may have served a useful role in creating a plain and simple but distinctly scriptural text. Whatever the reason, the data point to something interesting going on, something beyond a clumsy imitation of what Joseph might have seen in Genesis 3. But was this all just an accident, just his language, his style of writing when he was trying to sound scriptural? Further tests might be helpful. In searching the nearly 300 pages of the 1835 Doctrine and Covenants, including the Lectures on Faith, I was quite surprised to find that the word did was not used much at all. It occurs just 72 times. It occurs nearly 2000 times in the Earliest Text of the Book of Mormon. This is a dramatic difference before we even consider the subtlety of ADP did. Most of the 72 occurrences interrogatory or negatives. Many are buried in one section with a series of rather boring questions and answers taken from Genesis ("Q. In what year did Seth die? … Q. In what year did Enos die? … Q. In what year did Cainan die? etc. etc."). As for ADP did, there are only around 11 cases, depending on how you count them, two of which come from simply quoting Genesis 3. So out of hundreds of past tense statements from Joseph in this volume, less than 10 are in ADP form. It's a rate consistent with modern English and wildly unlike the Book of Mormon text, even though large parts of the document are in KJV-style English, laced with "thee" and "thou," the obvious stuff in KJV language, but quite devoid of the subtlety of ADP did. For instance, Abel, before he received the assurance from heaven that his offerings were acceptable unto God, had received the important information of his father, that such a being did exist, who had created, and who did uphold all things. Neither can there be a doubt existing on the mind of any person, that Adam was the first who did communicate the knowledge of the existence of a God, to his posterity; and that the whole faith of the world, from that time down to the present, is in a certain degree, dependent on the knowledge first communicated to them by their common progenitor; and it has been handed down to the day and generation in which we live, as we shall show from the face of the sacred records. We have now shown how it was that the first thought ever existed in the mind of any individual, that there was such a being as a God, who had created and did uphold all things: that it was by reason of the manifestation which he first made to our father Adam, when he stood in his presence, and conversed with him face to face, at the time of his creation. Thou didst baptize by water unto repentance, but they received not the Holy Ghost; but now I give unto thee a commandment, that thou shalt baptize by water, and they shall receive the Holy Ghost by the laying on of the hands, even as the apostles of old. Now this is not all, their faith in their prayers were, that this gospel should be made known also, if it were possible that other nations should possess this land; and thus they did leave a blessing upon this land in their prayers, that whosoever should believe in this gospel, in this land, might have eternal life; yea, that it might be free unto all of whatsoever nation, kindred, tongue, or people, they may be. ...and I have trampled them in my fury, and I did tread upon them in mine anger, and their blood have I sprinkled upon my garments, and stained all my raiment: for this was the day of vengeance which was in my heart. But in the summer of 1836 these threatenings began to assume a more serious form, from threats, public meetings were called, resolutions were passed, vengeance and destruction were threatened, and affairs again assumed a fearful attitude, Jackson county was a sufficient precedent, and as the authorities in that county did not interfere they boasted that they would not in this; which on application to the authorities we found to be too true, and after much privation and loss of property, we were again driven from our homes. Doesn't sound anything like the Book of Mormon, of course. Incidentally, I also searched for the EModE phrase "if it so be" that is often used in the Book of Mormon. It does occur in the 1835 Doctrine and Covenants, but only 3 times. The word if occurs about 800 times, compared to 656 times in the Book of Mormon, which has dozens of "if it so be" examples. The Doctrine and Covenants does use "if it be" 10 times. Next up: the command syntax of the Doctrine and Covenants. Since it began as the Book of Commandments, there ought to be some good command syntax there, and perhaps plenty of cases similar to the Book of Mormon. Need more time to look at that issue, I hope it will be interesting. So far I'm not seeing easy-to-find evidence that Joseph's inherent language coupled with Bible imitation could account for the subtle use of ADP did in the Book of Mormon text. Something else must be going on.